Frehner Wealth Management operates under the belief that our sole obligation is to our client’s financial well-being. Our investment philosophy is an extension of this belief. We believe financial markets, while often challenging, will provide an opportunity for our clients to pursue their objectives. Our philosophy originates from research-based views on how human beings learn and behave, and is joined with the view that financial markets, given the requisite discipline, do work. At the heart of our investment philosophy, is the knowledge that markets will rise, but not without interruption, and markets will fall, but not forever. We further believe it is exceedingly difficult, and more often than not, counterproductive, to try and time market gyrations. Our job is to invest our client’s capital, not merely to trade it. We believe that creating a diversified asset allocation that is aligned with each client’s financial objective, and is constructed to endure through multiple market cycles, is the foundation for a successful investment strategy. A core principle of our investment philosophy is that many markets operate with great efficiency. Conversely, we believe still other markets are less efficient and offer the potential for outsized returns to be captured via active asset management. This potential may only exist for a limited period of time, as markets mature, financial advancement allows an asset class to become more accessible to Main Street investors, or a larger percentage of investors become increasingly comfortable with the investment. The majority of investments we consider to be less efficient, reside in the traditional income and non-traditional alternatives asset class categories. It is much more likely that we would allocate funds in these classifications to an active manager. 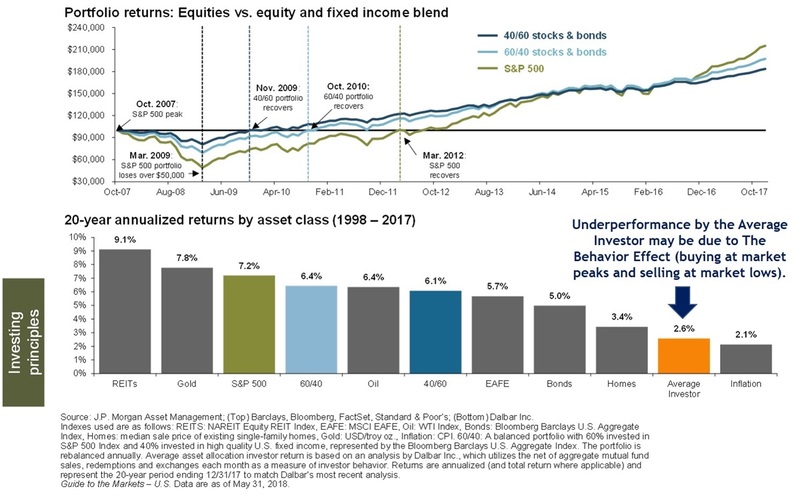 The final, and perhaps most important, aspect of our investment philosophy is managing the behavior gap of returns that exists between market returns and investor returns. The human condition leads to many cognitive errors, which negatively influence investor behavior. Herding (blindly mimicking the actions of the broader market), and overreaction and availability bias (overreacting to recent news events), are two examples of emotional behaviors that can lead to decisions which cause investor underperformance. An important component to our investment philosophy is to remain neutral, objective, and disciplined. Making rationale, unemotional investment decisions, as set forth in their investment plan, gives our clients the best chance to pursue their financial objectives, through both prosperous and challenging times.